Gold & Silver Number & Letter Stickers are ideal for labelling and numbering in your home, out and about or in your business premises. This best-selling number and letter sticker range is available in a choice of silver or gold brushed self-adhesive aluminium, provide an eye-catching and effective finish for all your signage and labelling needs. 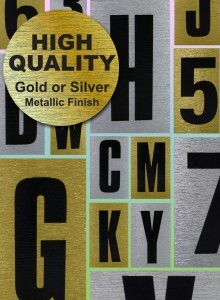 Gold & Silver Number & Letter Stickers are available in numbers 0 to 9 and every letter of the alphabet plus some of the most popular symbols found in everyday use, so whatever your message you are sure to find the means to express it. Gold & Silver Number & Letter Stickers are printed in the UK according to rigorous quality standards, giving you the peace of mind that they are safe wherever you choose to use them. Their self-adhesive backing makes them easy to apply and the high-quality inks and materials used by Classic Sign in their manufacture ensure that they will retain their sparkle even when exposed to the elements. Gold & Silver Number & Letter Stickers can be applied to any clean, dry and smooth surface, making them ideal for labelling your front door, garage, office, meeting rooms and reception area. And their use is not limited to fixed areas either. How about personalising your car, van, boat, caravan or even your bicycle to make it sparkle and stand out from the crowd?